Summer is in full swing here. I had a request from my daughter for some small ice cream treats. She made a menu of crazy food items like tuna cream, sunny delight, and other wild stuff that was ice cream. 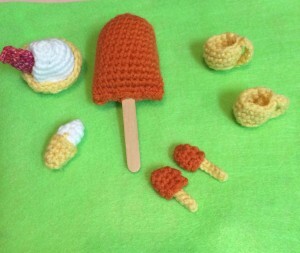 So I made a few little items for her to complete her ice cream shop. I made the big Popsicle first then she told me that they needed to be small since the ice cream shop was for her small animals. I made the other pieces smaller. She was pleased for the most part. I made a bowl of cream and a removable fish. She told me the fish was supposed to be gray, so I need to re-do that. It’s fun to make her items and to be challenged to make something from her imagination.